Berserk: The Cataclysm is a challenging free to play TGC MMO that allows players to use their own strategies and tactics to build mini decks called Squads, to fight in exciting and addictive combat. 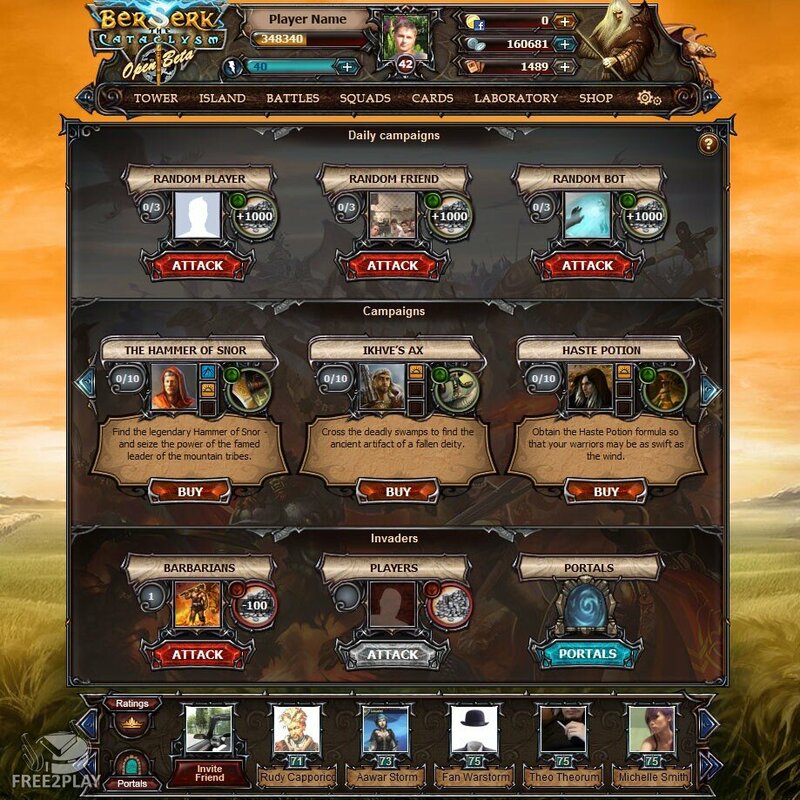 Players can complete several PvE campaigns or fight against other players in brutal PvP arenas. 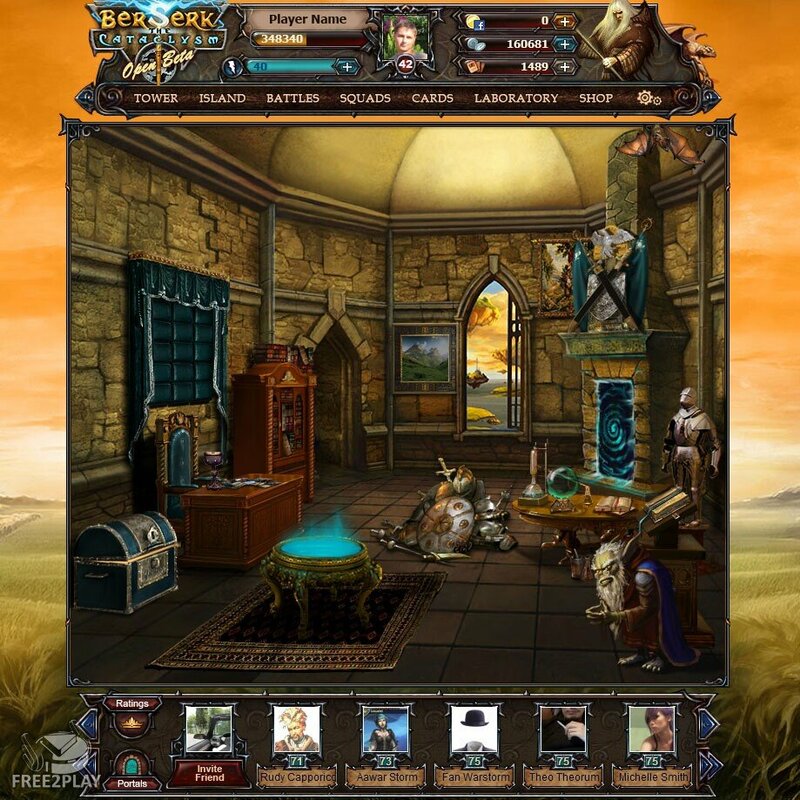 The game is available on several platforms, including web browsers, iOS and Android devices as well as Facebook. 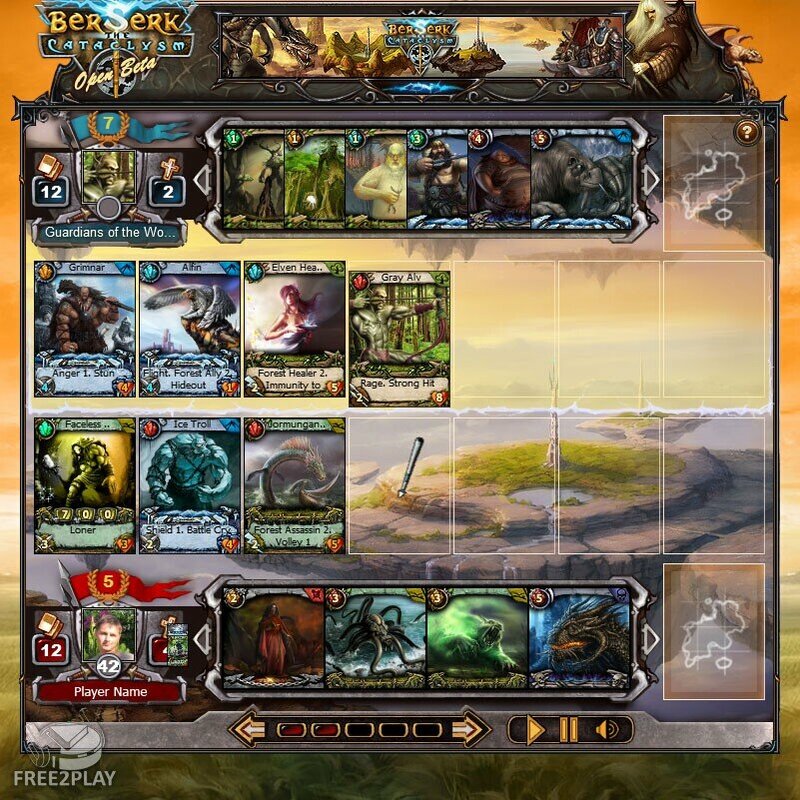 Berserk: The Cataclysm allows players to face both opponents controlled by the AI, as players from around the world, using an automated combat system, in which the preparation and the strategies are vital to win. Players will need to build small decks of seven cards, also called Squads, and use them to confront their rivals (there are situations in which players control more than one Squad in combat). 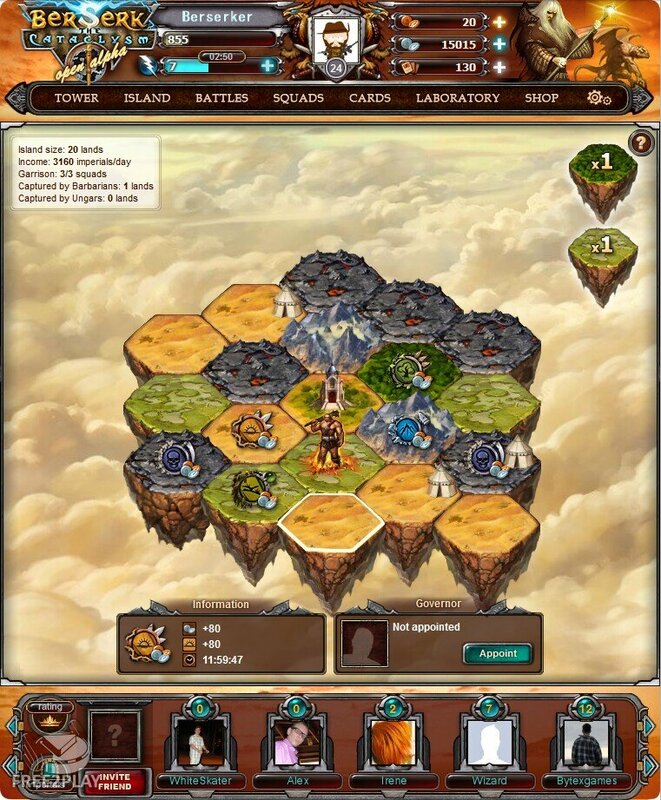 As players gain level they unlock new features and game systems; in addition when players progress through the game's PvE campaign they can become the owners of a small territory which will provide them with resources that they can spend in the game, but they must defend these territories from the attacks of other players who try to steal their resources. The basic premise of the game is that players fight their rivals using a squad made up from one of the five different elementary factions available in the game: Plains, Forests, Mountains, Swamps and darkness. Each card has a few attributes that determine the damage they do, the damage they can withstand and the rounds you have to wait before they come into play. Combat is completely automated, and once starts the cards are drawn from the players Squads and putted into play randomly. Once a letter is drawn from the deck you will need to wait their turn value to come into play, and it will be placed on your battle line, a row made up of 7 positions and the card is placed in the first available position from left to right. At the end of each turn the cards do damage to what is in front of it, either another card, or directly to the rival player, damaging its Leadership value (basically their health). Many cards have special abilities such as being able to shield other cards, damaging cards as soon as they enter the battle, auto moving around the battlefield switching positions and more options that add an important strategic factor to the game. The players will win the matches reducing the leadership of his opponent to 0, or destroying all your cards. Players can get more cards with Imperials, the in game currency which can be acquired by playing or buying it with real money in the game shop. Players have various options such as buying a standard Booster Pack to gain three new cards or paying extra to gain three new cards of a specific Element. In addition players can purchase new Squads giving them access to Squad Leader cards that they can then modify and customize to add in their new cards and build a brand-new Squad for that particular Element. As the game is free to play players can purchase these cards simply by acquiring the currency through playing or players can purchase Imperials using real-world money if they do not wish to spend the time playing and building up their decks more slowly.